Never before in history has a technology existed where anyone from anywhere can publicly deploy code that will immediately and indefinitely run on tens of thousands of nodes simultaneously and deterministically. Further, thanks to cryptography and cryptoeconomics, this technology is ownerless, trustless, and incentivized to continue. Once a contract is deployed, it is effectively autonomous, eternal, and controlled only by the laws of machines. This Simple contract has a count (uint8) that is initialized in the constructor and can be incremented from an add() function. That means the integer 253 will be passed into the constructor Simple(_amount) on deployment. At the current price of Ether it cost about $1.02 to release that code to the world. Pretty rad! Neat, so our current count is 253 and that’s what we deployed the contract with. 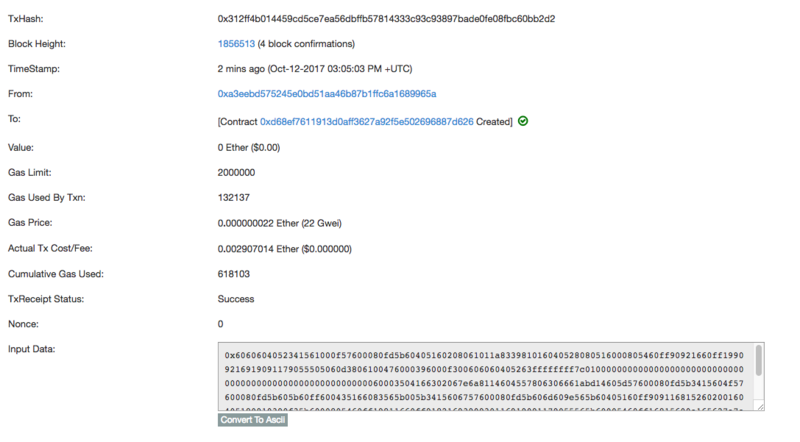 This was a read-only action, we didn’t change the state of the contract so reading the count is free for anyone to do as long as they are connected to the Ethereum blockchain. Let’s run the add() function on the contract to actually change the state. According to Etherscan, to add 1 to that uint it costs about $0.17. That might seem kind of expensive, but what’s actually going on there? Well, we broadcast to the network that we want to make a transaction, some lucky miner is able to find the correct nonce through brute force cpu power, mines the block containing our transaction and others, broadcasts that to the rest of the network, and then every miner in the world runs our transaction against their version of our contract and gets the same result. We could then ask any of them what our count is and it would be the same. Even as banks, businesses, and governments rise and fall, our count stays exactly where it’s instructed to stay. That is pretty freakin’ awesome. Let’s play around with gas cost a little more because contract interaction cost plays a huge role in how Concurrence will work. Last time it took about 25 seconds to go through. This time it took 55 seconds but the cost was $0.017 or so. This is because the miners are not only incentivized by block mining rewards but also the gas used to run the transactions. It’s up to them to determine which transactions are worth mining. We can trade cost for speed depending on our needs. We should also touch on security and bugs. This contract is public, so anyone can run the add function and anyone can see the current count. That’s fine for now, but what if there were 100 million USD at stake… yikes! This makes the job of contract developers extremely difficult because everything you do is at the mercy of every bad actor for the rest of time. Every contract interaction is deterministic; we can determine for sure what will happen given a state and an action, but just like a move in chess, predicting every single possible outcome on a chess board is also relatively difficult. Oh shart! Our account balance is 0! H4ckers! Well, not exactly, more like uint8 overflow, but you get the idea. It is incredibly important that you understand every aspect of every possibility your contract can encounter because a lot of real money is on the line.